–	AQUA Cancun, starting from $172 per night – Summer feels better at AQUA Cancun where guests can tickle their senses, frolic in the sand and surf, plunge into one of eight shimmering swimming pools or enjoy refreshing drinks and tropical fruits delivered right to their lounge chair, hammock or private cabana. –	Fiesta Americana Grand Coral Beach Cancun, starting from $170 per night – Indulgence has a new name at Fiesta Americana Grand Coral Beach Cancun where hundreds of feet of luxurious pool and sundeck span the property. The resort’s unparalleled location on a secluded beach makes vacationing anywhere else unimaginable. –	Fiesta Americana Grand Los Cabos Golf & Spa Resort, starting from $130 per night – With five pools, two golf courses and amazing opportunities for sport-fishing, scuba diving, horseback riding and ATV tours that overlook the Sea of Cortez, Fiesta Americana Grand Los Cabos possesses the ideal blend of raw beauty and modern grandeur. The resort promises to deliver the perfect summer getaway for all, from the rugged, outdoors enthusiast to the sophisticated, cosmopolitan traveler. –	Fiesta Americana Condesa Cancun, starting from $83 per night – Situated on one of the most beautiful beaches in Cancun, the Fiesta Americana Condesa Cancun is synonymous with summer travel. Guests can enjoy the ultimate fun-in the-sun vacation, right on a large beach strip with sun beds and parasols, a relaxing multilevel pool, a variety of water sports and beach volleyball. –	Fiesta Americana Puerto Vallarta, starting from $81 per night – Defining summer in style, Fiesta Americana Puerto Vallarta stands out in Banderas Bay on the most beautiful beach in Vallarta. The sparkling pool, array of water sports and seaside beach volleyball create the complete vacation experience for couples or families. –	Fiesta Americana Cozumel Dive Resort, starting from $55 per night – On the island paradise of Cozumel sits the Fiesta Americana Cozumel Dive Resort. The resort’s private beach and peaceful Caribbean waters make it the ideal place to rest, relax and enjoy the sun. More active travelers, meanwhile will appreciate the resorts’ other offerings: diving and snorkeling in a multitude of life and color. This promotion is based on single or double occupancy for travel now through December 23, 2009, and is subject to availability at time of booking. This offer does not include taxes, tips and other service fees, does not apply for group reservations and is not applicable with any other promotional or discounted rate. Travel reservations must be booked on or before July 31, 2009, by calling 1-800-FIESTA-1 or by visiting http://www.fiestamericana.com/halfprice. Grupo Posadas, with more than three decades in the hotel marketplace, operates 111 properties and more than 19,600 guestrooms in 50 beach and city destinations in Mexico, Brazil, Argentina and Chile. 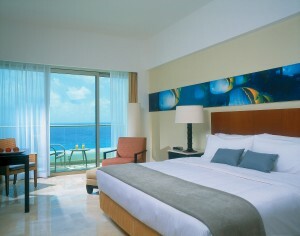 In Mexico, the company operates 20 percent of its rooms in the tourism segment. Its seven hotel brands are AQUA, Fiesta Americana Grand, Fiesta Americana, Fiesta Inn and One Hotels in Mexico, and in South America, the company operates Caesar Park and Caesar Business, making Grupo Posadas the leading Mexican hotel operator in Latin America. Grupo Posadas has been listed on the Mexican Stock Exchange since 1992, with the ticker symbol “POSADAS.” For additional information, visit its website http://www.posadas.com.